In our previous post, we discussed social media use of 2016 presidential candidates. We tracked the candidates’ usage of Facebook to understand how candidates interact with the public and any difference those interactions make in election outcomes. In this post, we are going to share several insights into the topics discussed on the Facebook pages of five presidential candidates: Hillary Clinton, Bernie Sanders, Ted Cruz, John Kasich, and Donald Trump. The purpose of this is to understand the type of content and messaging people are responding to in the form of likes, shares, and comments. We analyzed candidates’ posts to discover topics and reactions on posts. To discover topics of posts, we employed a probabilistic topic modelling algorithm, latent Dirichlet allocation (LDA). In topic modeling, a topic is represented by co-occurring words. For example, a topic like Iran deal, ISIS, and gun control was most likely discussed in the same context “national security”. When a candidate talks about the Iran deal, most likely he or she will address ISIS-related policy. Gun control was in the same group with Iran deal and ISIS because it discusses crime and safety. Therefore, the algorithm assumes these sub-topics should be grouped into one group. Topic modeling algorithms are still undergoing development within research community. We found that Republican candidates focus on four major topic groups: ‘Iran deal, ISIS, gun control’, ‘Planned Parenthood’, ‘immigration and Obamacare’, and ‘taxes and federal spending’. Democrats have focused on four major topics namely: ‘women’s rights and education’, ‘Wall street and middle class’, ‘climate change and income inequality’, and ‘health care and Social Security’. While Trump’s posts focused on the Iran deal, ISIS, and gun control, Clinton’s posts focused on women’s rights and education. 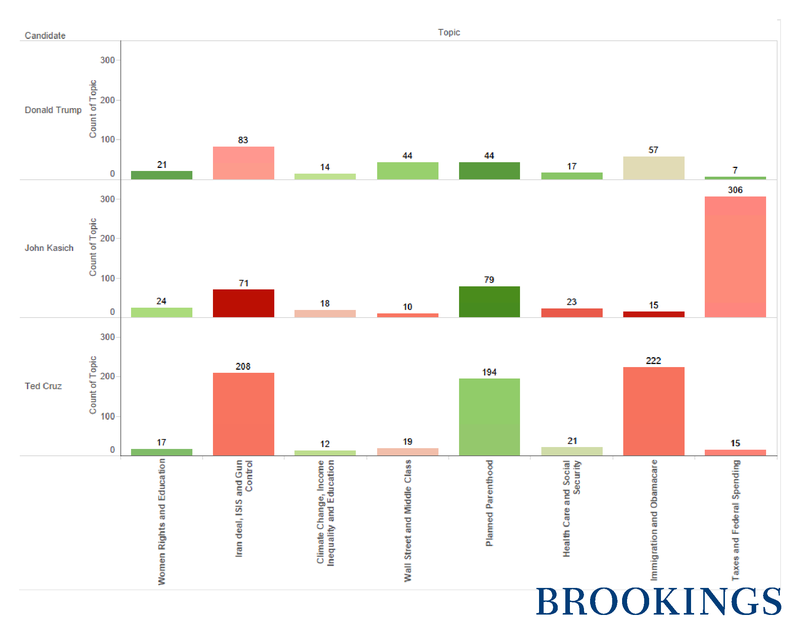 When analyzing sentiment of comments on Republicans’ posts related to the Iran deal, ISIS, and gun control topic, we found that commentators reacted with negative sentiment in the form of anger. For Democrats, people commenting on the Wall Street/middle class topic reacted positively, through showing their support to the proposed reform plan. Below, we have compiled five figures that illustrate the topics discussed, topics distributed across candidates, topic distribution by party, and sentiment analyses. 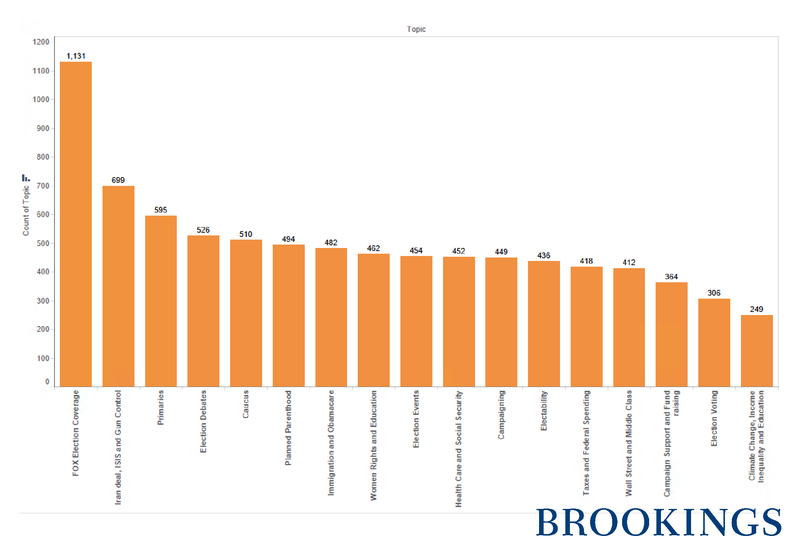 Figure 1 reflects the distribution of topics discussed on candidates’ Facebook posts. We ran topics discovery and modeling using LDA topic modelling on all posts by candidates between January 1, 2015 and February 28, 2016. There are two main categories of topics: elections related topics (such as Fox election coverage, primaries, and election debates), and policy related topics (such as the Iran deal, ISIS, gun control; Planned Parenthood; immigration, and Obamacare). Among the most discussed topics in the elections category is the Fox News elections coverage, where Trump complained that the channel treated him badly and Megan Kelly insulted him at the August 2015 debate. His boycotting of the Fox News debate sparked discussions as he continued to blame Fox for leaning toward Cruz, especially on Bill O’Reilly’s program. 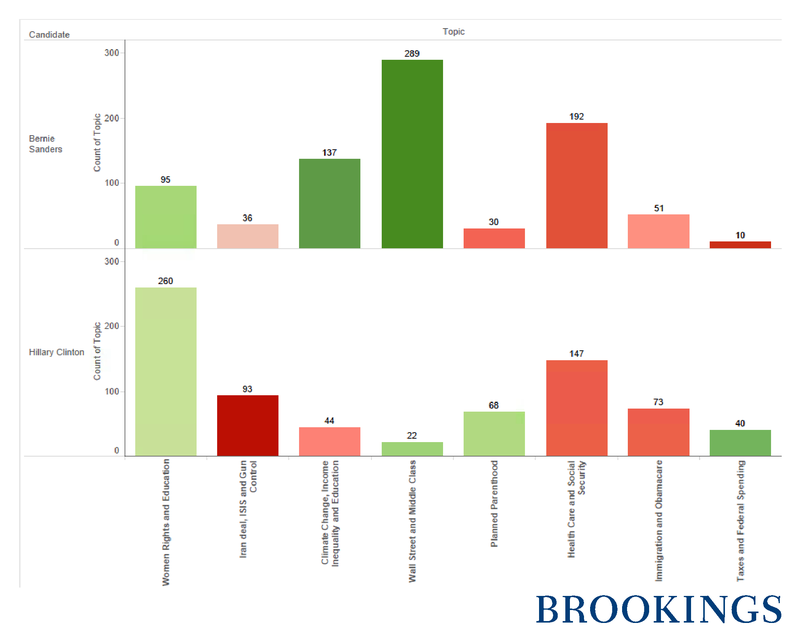 Not surprisingly, the most discussed topic in the policies category is national security in terms of the Iran deal, ISIS, and gun control. Within policies category there are other important topics such Planned Parenthood, women’s rights, education, and taxes/federal spending. Unlike other elections, the least discussed topic on this election is climate change and income inequality. Our focus in this article is to study policy related topics. The distribution of topics for each candidate is presented in Figure 2. Numbers on each topic band are the total number of posts for that topic, and numbers on each candidate band are his or her total number of posts. On Democrats side, Clinton is active on women’s rights and education topics while Sanders is active on Wall Street and the middle class. Both candidates are active on health care and Social Security. Republicans are active on different topics. Kasich is focusing on Taxes and federal spending, Trump talked more about the Iran deal, ISIS, and gun control, while Cruz is focusing on various topics: immigration, Obamacare, Planned Parenthood, Iran deal, ISIS, and gun control. Figure 3 shows the shifts of topics over time. The Y axis is the volume of posts and each topic’s volume is represented by its colored band. 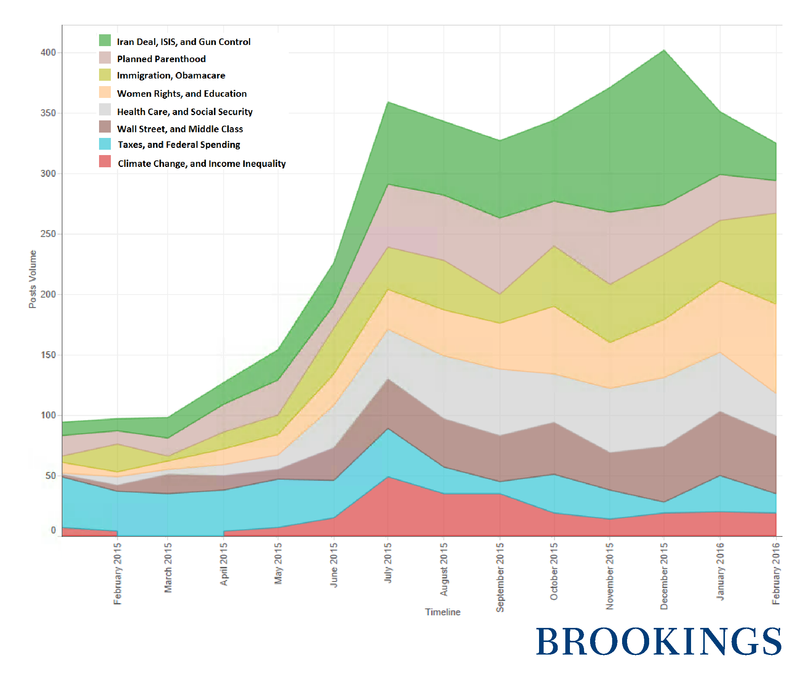 Taxes and federal spending topic (blue curve) has a steady volume except at the end of 2015 (December) where these topics were discussed most. There is a positive correlation between offline events and topics discussed online. For example Paris attacks (November 2015) and San Bernardino shooting (December 2015) both increased the volume of its related topics: ISIS (dark green curve) and immigration (dark golden curve) during Nov/Dec 2015. We further analyzed topics distribution and reactions of people on each candidate’s post in terms of sentiment as given in Figure 4. The green to red color scale represents the sentiment score, where red is negative reaction and green is positive. Republicans’ campaigns have focused on four major topics: ‘Iran deal, ISIS, gun control’, ‘Planned Parenthood’, ‘immigration and Obamacare’, and ‘taxes and federal spending’. For all candidates, the reactions on Iran deal, ISIS, and gun control are negative which show the outrage of people on this topic. On the Planned Parenthood topic, all candidates have positive reactions as people supported their candidate no matter their stance on the proposed plan. On immigration and Obamacare, both Cruz and Trump proposed to stop illegal immigrants and build a wall along U.S.-Mexico border. Such posts sparked anger from people, whether anger on the proposed plan or anger towards immigrants and other minorities in general. On taxes and federal spending, Trump posted a few posts and received positive reactions; whereas, Kasich was considerably active on this topic and received noticeable negative reactions. Democrats have focused on three major topics namely: ‘women’s rights and education’, ‘Wall Street and middle class’, and ‘health care and Social security’. In Figure 5, Sanders is active on Wall Street/middle class topic and he received very positive comments. However, he received negative comments on his next major topic health care/Social Security. Clinton is active in promoting women’s rights and affordable education in her campaign and people are reacting to some degree positively to her posts. Besides that topic, Clinton is active on health care/Social Security topic. She supported the Affordable Care Act and promised to enhance and protect Social Security and Medicare. The analysis of topics discussed by presidential campaigns and voters on Facebook reveals several interesting findings. First, there is significant variance between reactions to a given topic based on the candidate page where it appears. Second, there are clear differences between topics the candidates of the two parties focus on. 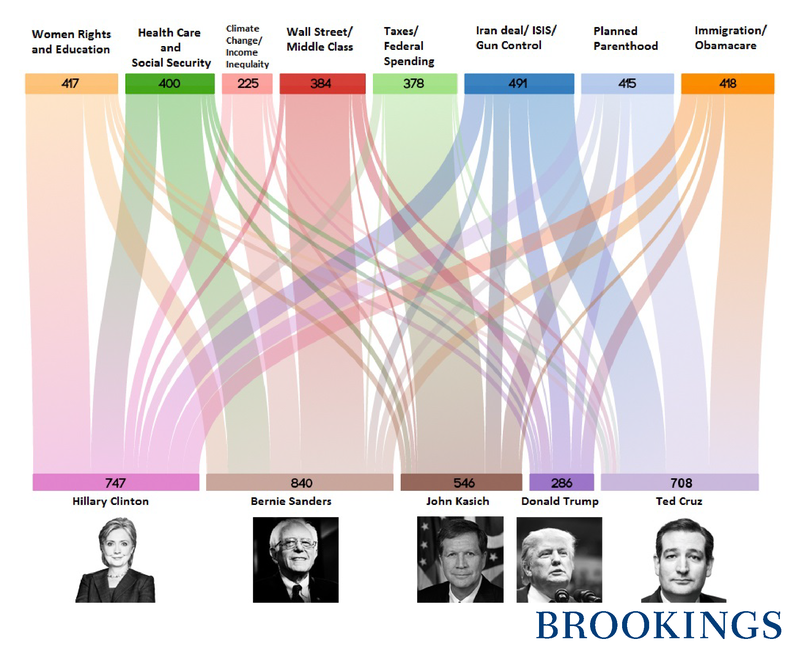 Third, we can look at how each of the Republican candidates leveraged the Facebook platform. Trump had a far more targeted focus compared to his rivals, Cruz and Kasich. Trump also had on average far more positive (or neutral) sentiments on topics discussed than his two rivals, especially on core issues such as taxes and federal spending, whereas his rivals received positive reactions on the Planned Parenthood story. Variance in sentiments and focus is also present in the posts made by Democratic candidates and their commentators. The data on topics and comments gives us a glimpse into what conversations get traction online during presidential elections.